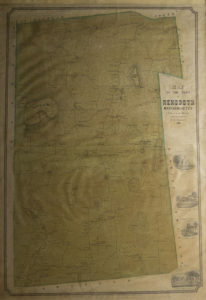 This wall map, created from surveys made by civil engineer, surveyor, and cartographer Henry Francis Walling (1825–1888), is the oldest known published map featuring Rehoboth’s present-day borders, which were finalized in 1812 when the western portion of the town became Seekonk. Walling grew up in Providence and worked for a civil engineer there until about 1850, when he began his own business. The first maps he published were of five towns in Bristol County, of which this is one. He went on to establish a successful map-making business in New York and later worked for the U.S. Geological Survey. The map is valuable today, for it gives us evidence of the locations of schools and businesses, as well as the names of individual property owners in the mid-nineteenth century. Like other Walling maps, Rehoboth features illustrations in the margins. Depicted are the Congregational Church in Rehoboth Village and three prominent residences: those of Lyman Pearce’s home on Pleasant Street, Benjamin Peck’s house on Water Street, and James Blanding’s home on Broad Street. Elm Cottage, as it is referred to, is the house where James’s son William Willet Blanding, a founding member of the Rehoboth Antiquarian Society, lived his whole life and collected his family’s heirlooms. 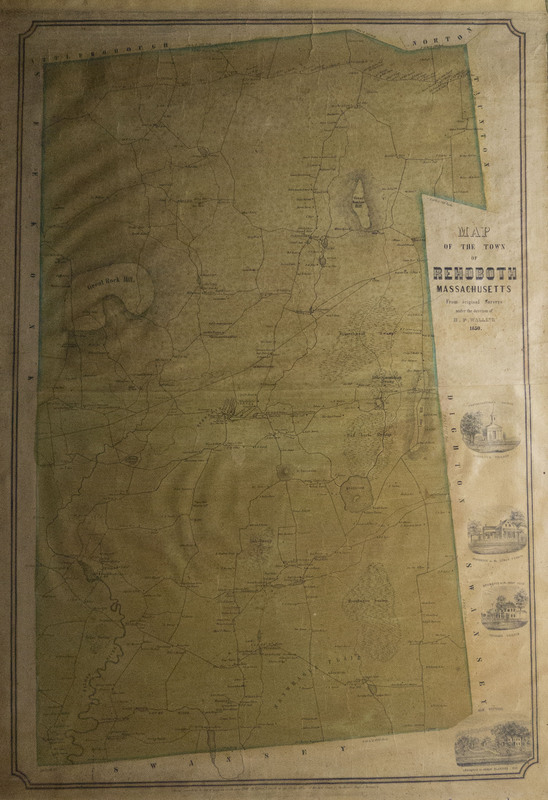 Until recently, this copy of the Rehoboth map had always hung at 191 Reservoir Avenue, formerly the home of printmaker Peter Chalmers and identified in 1850 as the property of James Horton II. < Flax breaker, Hatchel, & Flax wheel, 18th–early 19th C.